The Baku City Centre track is one with many cousins. Any new circuit will attract comparisons, especially so these days for a number of reasons, but it's hard to think of a debut venue that ever has attracted as many as this one. Street circuits almost inevitably are judged at least to some extent against the Monaco yardstick, and this one has with its tight and twisty section near the castle a particular Principality redolence. Yet in Baku too there is a flat out part that even dwarfs Monza's in length. Perhaps the combination made it more like Montreal. The wide open downtown streets made up of long straights and tight turns was a lot like Singapore some said; others thought there was a bit of Valencia in there. The smooth asphalt was reminiscent of Sochi's. Some even ventured outside F1 by stating the mix of a full throttle section near the sea plus an intricate and up and down hill section inland was a lot like Macau. But in today's inaugural European Grand Prix qualifying session in Azerbaijan we can go full circle, back to the first comparison mentioned. The hour to set the grid was pure Monaco. All disruption, a matter almost of survival, not just from the walls but from traffic. As well as from yellow flags, even a red one, that can and did ruin attempts to set a mark. Cars venturing down escape roads has been a routine occurrence all weekend. At times it's looked a little like amateur hour. And many of the escape roads are so tight that cars could only reverse out of them, thus increasing the length of the yellow flag disruption. Laptimes banked counted for more than pace on paper. "There was a lot going on all over the place, and that's down to the track" said Nico Rosberg afterwards aptly. Things were crowded; disjointed; unpredictable. And it was reflected in the final order in large part. Not least for Lewis Hamilton. Before even a wheel had been turned at the venue plenty thought it would suit him down to the ground. All big braking zones and shaving walls would be just his thing. Add to that, in Red Bull boss Christian Horner's words, "if ever there could be a circuit built for Mercedes, it's this one". In Friday's running it looked almost precisely that way too. Lewis was imperious, his already mentioned team mate Rosberg barely in touch. The rest were not even in remote touch with Nico. It seemed Merc could cruise to fill the front row at 80% chat. Perhaps Lewis could do the same to get pole. He today though experienced the old adage that there is many a slip between cup and lip. Or that one about things changing very quickly. There was an advance warning in practice early on Saturday. 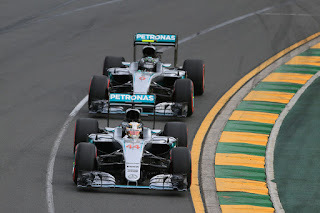 Lewis ended up on top but only with a late lap and in contrast to the day before it was Nico that was ahead for the most part. In the quali hour things remained that way, with Rosberg suddenly beating Hamilton - perhaps Nico as he does so often had done his homework between days - and Hamilton seemed to be showing the strain. He frequented an escape road in Q1 then in Q2, after backing off in his first effort, had another visit to an escape road on his next flier which meant he looked under genuine danger of not even making it to the final part of qualifying. Only a last gasp effort got him in. But even so in Q3 matters refused to settle, and it got contagious for Mercedes as Lewis again went down an escape road and the subsequent yellow flags ruined Nico's lap too. All of a sudden it was the unlikely figure of Sergio Perez occupying the provisional pole slot as the time ticked down. It seemed appropriate though that not even that was entirely as it seemed, as Checo in fact couldn't fight for pole as he was carrying a five place grid drop thanks to a gearbox change resultant of him hitting the wall himself in earlier practice. There were reasons to think in advance the track would suit him and the Force India, but even so their potency surprised. Then Lewis's tale of woe reached a crescendo finish. On his next flying effort on the same run he tagged an inside wall, leaving him and his Merc parked gingerly with its front wheels pointing in different directions. It left him too in a session, indeed a weekend, that we thought would be a Lewis demonstration run, starting a gentleman's tenth place. It again had a certain aptness that it also almost immediately got a little worse for Lewis still as Nico then set finally a time good enough for pole, and comfortably. His 1m 42.758 was some eight tenths clear of the rest and he didn't even in so doing match his Q2 time. And he did it just before the red flag was thrown for Lewis's crash. "It was one of the more challenging sessions out there," Rosberg said later with some understatement, "but everything worked out well. "There was a bit of reorganising because for example in Quali 3 Lewis had an off in front of me, so I had to abort that lap and then I just had one more attempt at the end, but that worked out fine. No, I'm very, very happy. It was great." As for him trailing Lewis earlier in the weekend but his stable mate today having more trouble, Nico again was gleeful. "I'm really pleased with that" he said, "because all weekend we've been building towards it and in qualifying it was really optimum, so it felt good." 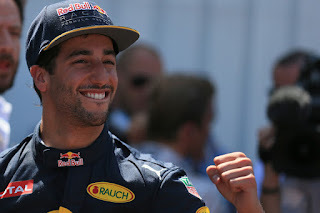 He'll perhaps be minorly relieved too that the major change in that brief final segment was that Daniel Ricciardo pipped Sebastian Vettel for the net position alongside him on the front row - they actually set exactly the same time but crucially Ricciardo set it a few seconds earlier - what with some of Seb's race starts this season. But then again, you may be shouting at this point, where did Seb start in Montreal last Sunday? 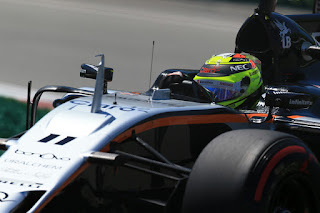 Neither though beat Perez's mark whose bittersweet P2 in the session stands, if not in the starting order. And he was suitably conflicted afterwards. "Yeah it does [feel like pole], to be honest it does", he said of his stunning laptime. "Obviously I'm still a bit angry for the mistake this morning. I think it's a mixed feeling for me today. I think the lap that we put together in Q3 was very, very strong. It was a very difficult session for me because of the crash. You lose some confidence and to get it back and get in the rhythm again was great. "I think we were expecting ourselves to be strong around here but not that good," he added, as well as that he expects a strong race. As we know it doesn't take long for people to point fingers at Lewis's 'lifestyle' whenever anything goes wrong for him (some even did so with his run of engine failures in qualifying earlier this campaign...), and sure enough plenty quickly depressed the rewind button to his words on Thursday, when he spoke of not doing a track walk and only completing eight laps of the new circuit on the simulator (in contrast to Nico doing a track walk and upwards of 100 simulator laps). The algorithm is perfect they thought, but any scientist would also tell them that correlation is not (necessarily) causation. Surely also were it true then it would have affected him, even more so indeed, on Friday. And, emphatically, it did not. The man himself instead spoke almost literally of a bad day in the office, perhaps related to some overnight set-up changes. 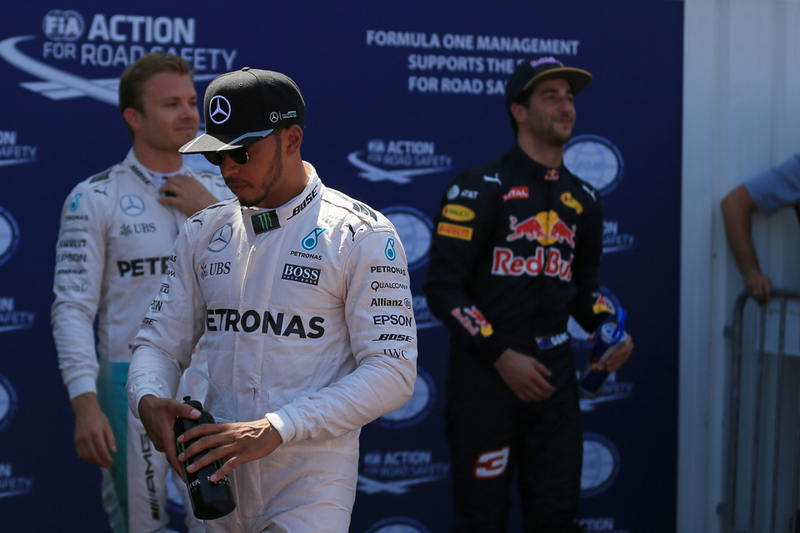 "I had fantastic rhythm yesterday and zero today" Lewis said. "Sometimes that happens...I was not on it today. "The car was generally good" he went on, "just wasn't hitting the apexes, just wasn't hitting the right braking zones, just none of it was in the right place today". Elsewhere he added that "it was just the most uncomfortable I've been a long time. I can't express why. Yesterday was great. Some changes overnight and not as great today." He also slapped away suggestions that the glare of the low sun had been a factor in his eventual prang - "no, it was just me" he said. Say what you like about Lewis - and for many of you it's plenty - he has a refreshing tendency not to eschew responsibility for on track errors and under-performance. One small consolation to him is that if there's anywhere on the calendar that you'd pick to start low down it possibly would be here. The evidence from the GP2 race is of plenty of smashes and resultant safety cars as well as an ultra-generous combination of DRS and slipstream down that extended full throttle section to aid overtaking. Even when following a quicker car passing it wasn't out of the question. Re-starts after safety cars have been particularly interesting, with the leader often being something of a sitting duck. And drivers will tomorrow need to stay well clear of those dread escape roads, as some have spoken of a 25 second time loss from disappearing down one. The flipside though is that Lewis - deep in what is sometimes called the carbon fibre zone - has somehow to avoid trouble himself. Either way, the race promises to be about as madcap, as attritional, as qualifying was. Even so such is the Merc pace advantage - make no mistake the final 1.2 second gap here will have caused a few shudders at Ferrari and Red Bull, even allowing for that both had some tyre warm-up problems in the surprisingly cool surface of Baku's later afternoon as shadows lengthen - you suspect that if any car does jump Nico at the start or at a re-start it won't be long until he's back through. It'll likely have to be done on track though, with easy one-stop strategies all round expected. 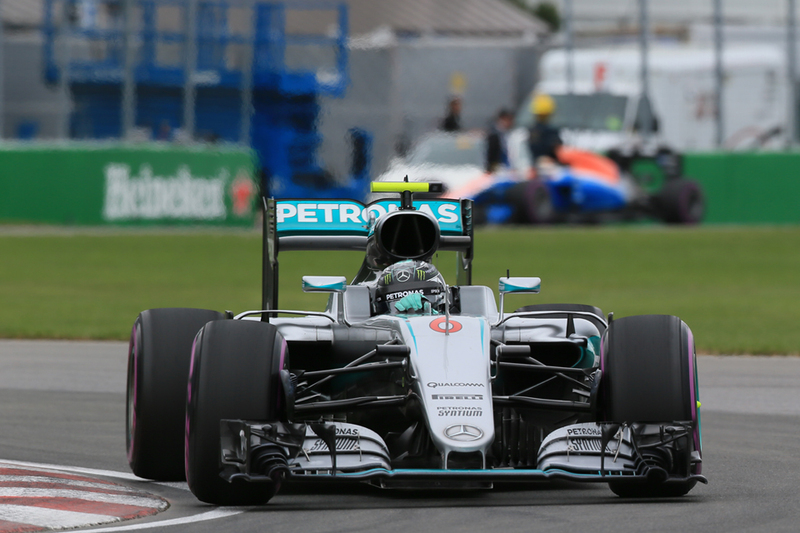 "The race I'm sure is going to be very exciting" said Rosberg in this vein. "It's one of the easiest tracks to overtake, so there's going to be a lot of changing places I think, probably a lot of safety cars as well, exciting re-starts and everything, so it should be a good show." As for his wandering Merc team mate? "Never forget him" Nico added. "He can always come back from tenth as he's shown very often this year." Lewis reckoned though that while "I'll do my best to try and gain as many points as I can" also tomorrow is a matter of "damage limitation". He insisted also that Nico has "a pretty easy run at the front...as long as he gets a good start he'll be gone". Perhaps the mind games continue. Not everything changed today in Baku.